Even when the temperatures are blistering hot, there’s nothing that I enjoy more than working in my garden. That includes decorating. I just get so much joy out of landscaping and turning my outdoors beautiful. Of course, I also love saving money, which is why I love these 25 DIY garden projects. You make them with sticks and twigs so they’re basically free! And who doesn’t love a great project when it’s free? Whether you’re decorating for a specific holiday or you just want to add a little beauty to your garden, I’m sure that you will find a lot of inspiration in these projects. There are specific projects for Christmas and even some great framed décor that you can hang on the fence or the side of your house. There’s so much that you can do with sticks and twigs and if you happen to have several trees on your property, you know you can find loads of sticks to use. You can even turn those twigs into gorgeous fairy furniture, which would go beautifully with this DIY fairy house. You can use those twigs to create support for your large garden vegetables and they’re much cheaper than buying bean poles or tomato cages. You can also use them to build a stunning arbor to support your flowers and while you’re busy decorating with your sticks, be sure to check out these other summery backyard projects to add a bit of beauty and charm to your outdoor living spaces. Seriously, you can make just about anything out of sticks and decorate your outdoors in such a lovely manner. If you love rustic, this is definitely the project list for you. So, if you have a few – or more than a few – sticks on hand, you can turn them into wonderful garden décor that won’t take you long at all to complete. Plus, you don’t have to worry about hauling them off or burning them in a brush fire. Instead, you just repurpose them into beautiful new things and add a nice little touch of nature to your garden. Who says you have to spend a small fortune to get a beautiful garden trellis? You can actually make one that looks just as good as anything you buy in stores. And, since you make it from twigs, it won’t cost you anything. 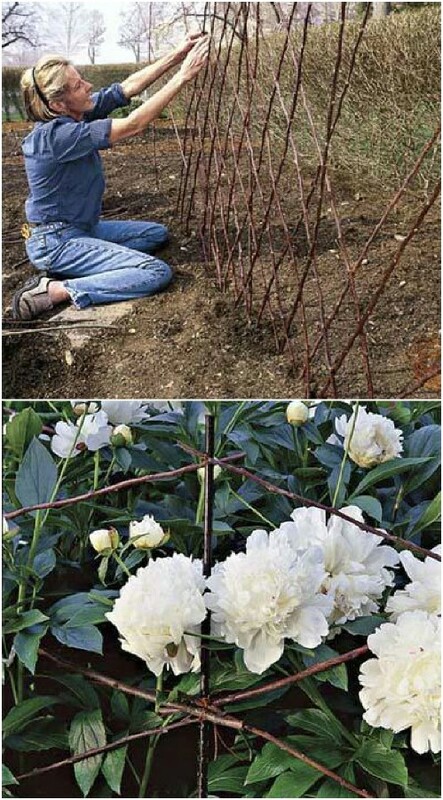 You simply attach the twigs to each other with small screws and you have a gorgeous arched trellis to showcase your climbing flowers and plants. This pendant lamp is made from twigs that are woven together and it’s absolutely gorgeous. You can easily make this, or just check out this already finished version that I found on Etsy. It’s the perfect way to add some natural charm and would look beautiful over a breakfast table or hallway table. You can get it for around $75. 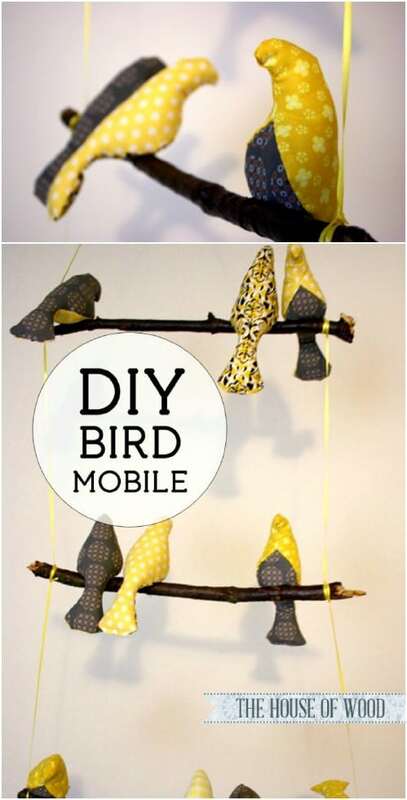 Whether you decide to hang this in the nursery or outside where the real birds can admire it, this upcycled twig bird mobile is the perfect project for those sticks in your yard. You do have to do a bit of sewing for the birds and when they’re finished, they rest on a small twig that you can probably find right there by your porch. It’s a gorgeous little mobile and such a fun and natural DIY project. 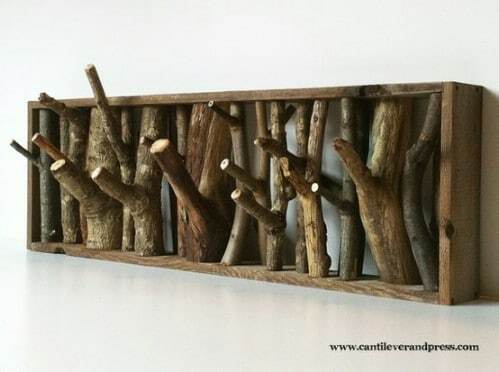 I really love the idea of making toolbox handles from twigs and sticks. 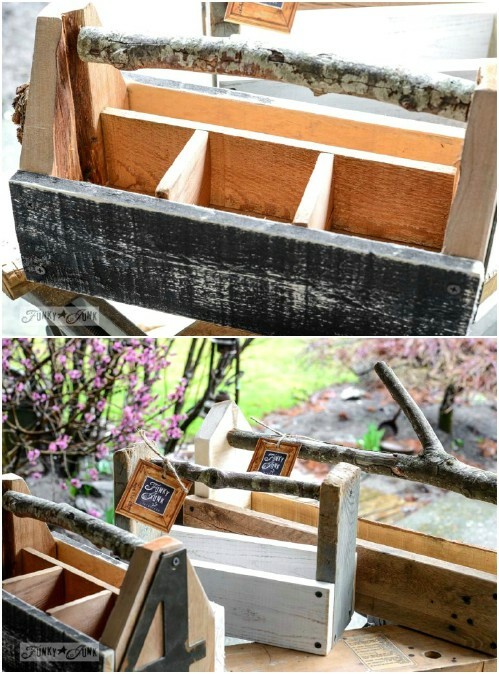 You could use this project to turn all of your gardening tool holders into a rustic twig project! It’s so easy, too. You just have to find sticks in the right thickness and then cut them down to size so that they fit into the handle slots of the wooden toolboxes, which you also DIY. The entire project just has rustic written all over it! How adorable are these little Christmas trees that are made from twigs and sticks? These are so much fun to make and to display and this is a great project for the kids. Let them help you gather sticks and then help paint them to make them more personalized. Attach a ribbon to the top for hanging and you’ve got the perfect outdoor (or indoor) Christmas tree decorations. Lattice is a beautiful way to decorate around the fence or the deck and you can make your own with those twigs in your yard. This is a rather time-consuming and somewhat complex project but it’s completely doable and it will look beautiful when you’re finished. You can even use your new lattice to allow vining plants to grow or even paint it when you’re finished to match your existing outdoor décor. Wattle fencing has such an old country look to it and you can certainly purchase a nice recreation from any home improvement store. You can also simply make your own and save yourself a few hundred dollars. This is not even that difficult to do and while you will need larger sticks for this one, it will definitely be worth snagging those thicker branches when you see this lovely fence outside your door. I really love flower gardens that have arches and arbors in them. They’re just so gorgeous! 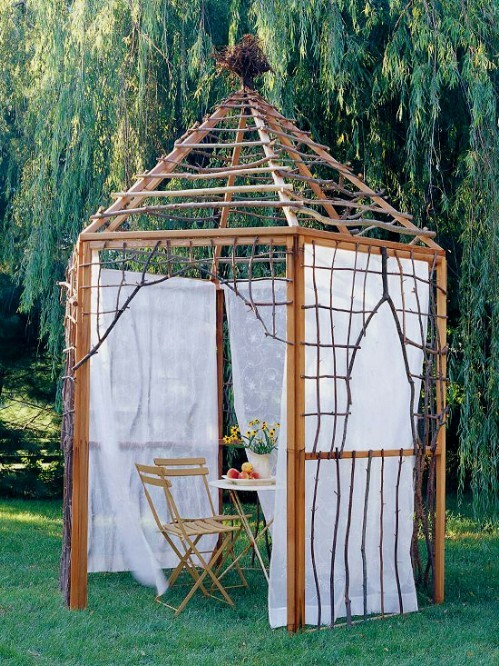 I also love the idea of making your own rustic arbor from twigs – because it’s so cheap. This is a relatively easy way to get rid of the sticks in your yard and give your garden a little makeover as well. 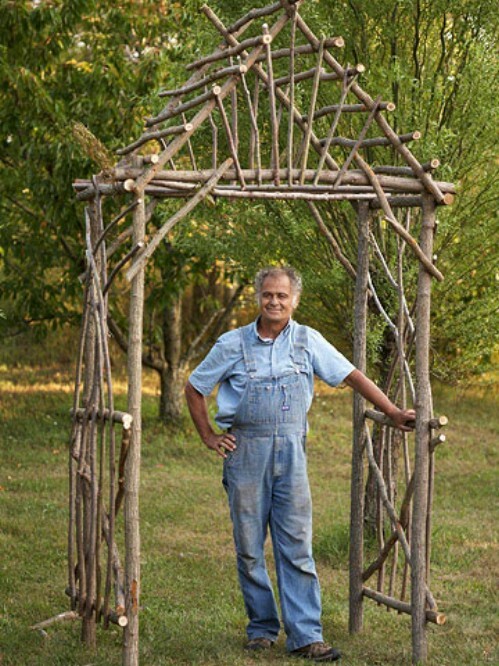 Plus, it would be the perfect arbor for a rustic outdoor wedding, don’t you think? 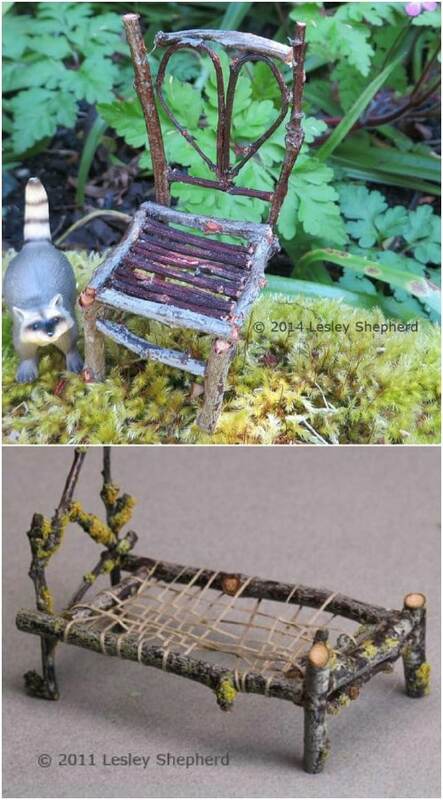 Turn those smaller sticks and twigs into adorable fairy garden furniture! My kids have always loved fairy gardens and this furniture makes it so easy to carry on the magic of those little fairies. From tables and chairs to an adorable little bed, you can create an entire collection of fairy furniture from your twigs and build yourself a lovely little fairy garden right there in the front yard. 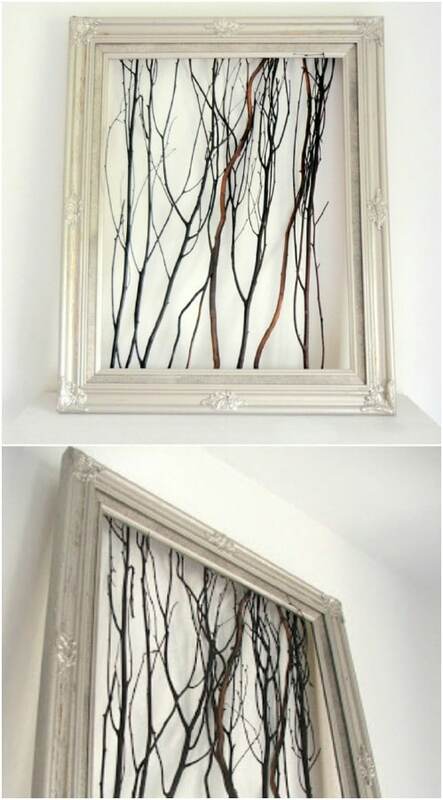 If you really don’t have time for a project but you really want to incorporate those twigs into your indoor or outdoor décor, why not just frame them? A cheap Dollar Store or yard sale frame and a few twigs are all you need to make this rustic framed twig art. Just cut your twigs to fit into the opening of the frame and then staple them into place. You could even paint them different colors if you wanted to really customize your art. Who wouldn’t love a cozy pergola in their backyard? I know I would and this twig and stick version makes it really inexpensive to get one. Plus, this project is really easy. You can build the pergola completely out of sticks – although you will need to have a few that are fairly straight – or build it from leftover wood from other projects and just fill in the sides and roof with twigs. Take those twigs and create a beautiful bird’s nest that you can use to decorate anywhere in your garden. 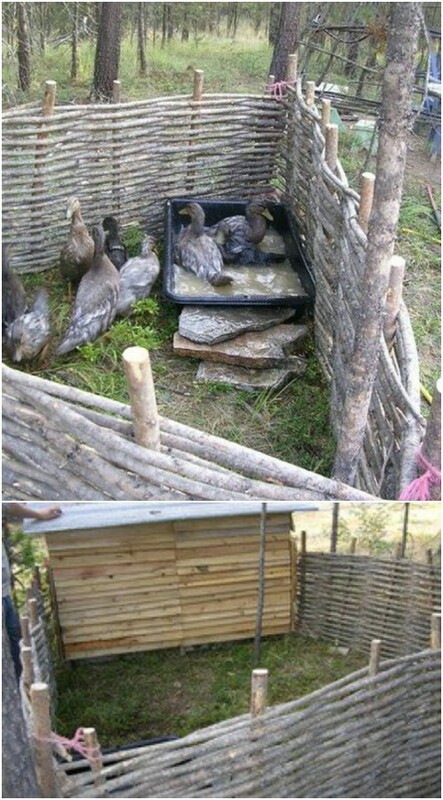 Kids are going to adore this project and they can help you to gather twigs and put the bird’s nest together. 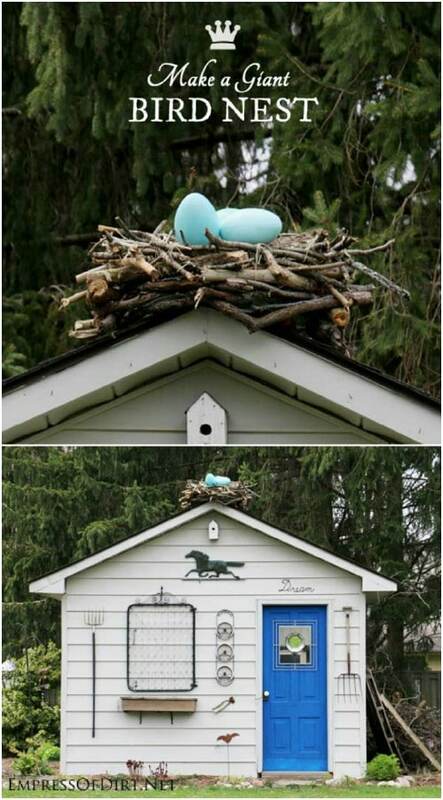 It’s pretty simple to do and when you’re finished, you can add “eggs” and a bird to your nest to make it look more authentic. 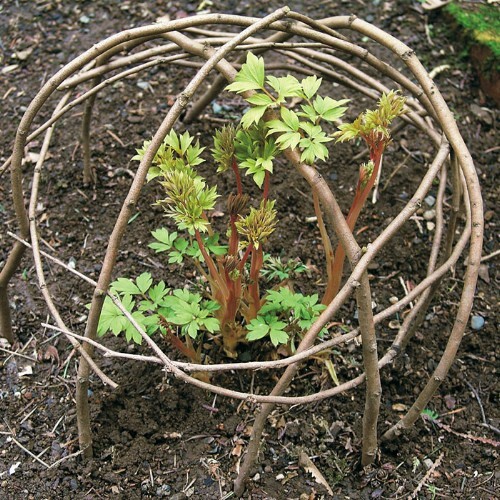 Those sticks and twigs can be turned into this globe shaped plant support for your flower or vegetable gardens. Not only will this support larger plants as they grow, it can provide a protective barrier for smaller plants so that they don’t get trampled or mowed down with a weed eater until they get big enough to see. Plus, it’s really easy to make and it adds a nice little decorative touch to the garden. Build your child his or her very own living treehouse! 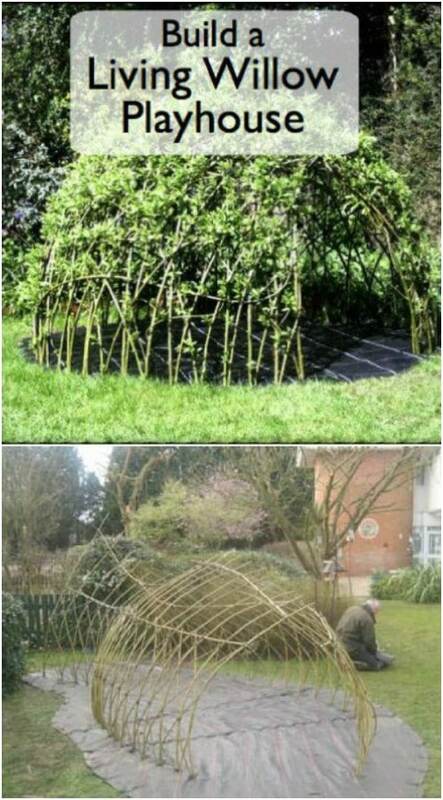 This living willow playhouse is not as difficult to grow as it looks and your little ones will absolutely adore having their very own playhouse. Plus, when you build and grow this one, you can save hundreds over buying a pre-manufactured playhouse and this one has a nice unique quality. You can also use it to support larger plants or vining flowers. Raised gardens are a great choice if you just don’t have room for a traditional garden or if your soil isn’t really plant compatible. 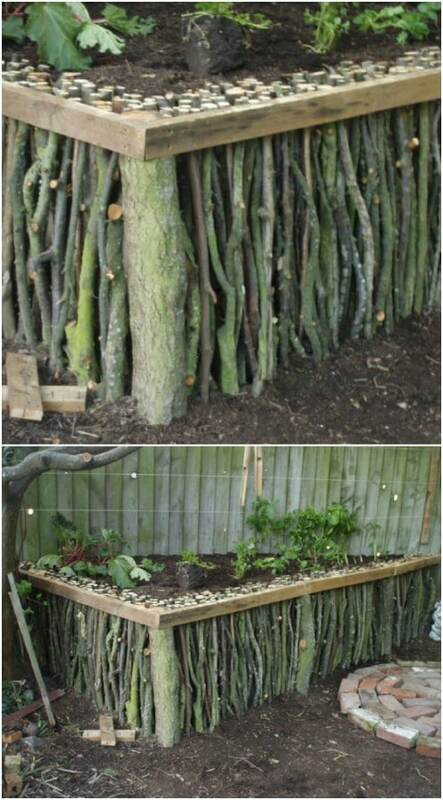 You can build your own raised garden bed from twigs and sticks that are lying around the yard. So you clean up the yard and get a great new garden at the same time. The twigs add a nice decorative touch and help to make your raised garden look even more natural. This coat hanger made from branches is really awesome and it looks really easy to make. You’ll just need to build a shadow box to hold your branches and then add them to the box. This would be a great coat hanger for the front porch to hold raincoats and umbrellas or you could hang it indoors, as well. How cool is this garden table? 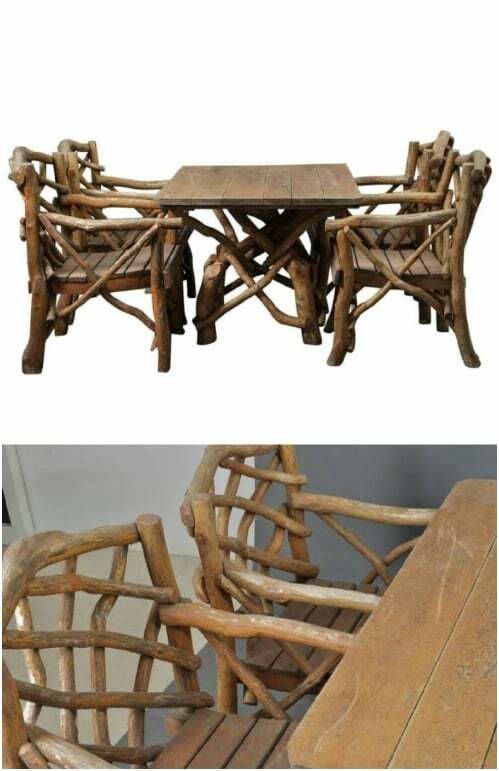 It’s made from sticks and twigs and it’s perfect for the patio or deck. Mind you, it’s not all sticks and twigs. There’s a bit of an illusion but it still looks like a stick table and it’s pretty easy to build. 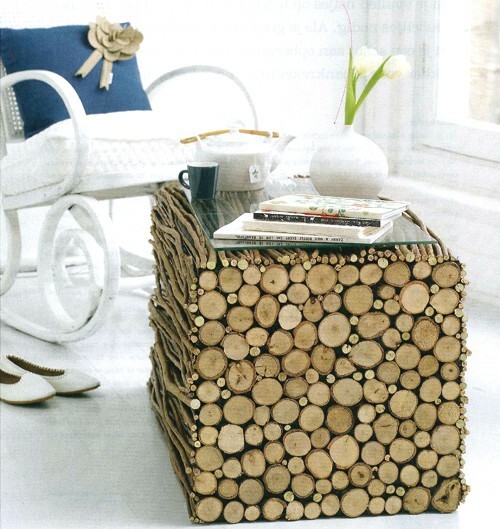 You just cover an existing cube table or something similar with twigs and rounds cut from sticks to make it look like you’ve stacked that wood and build the entire table around it. 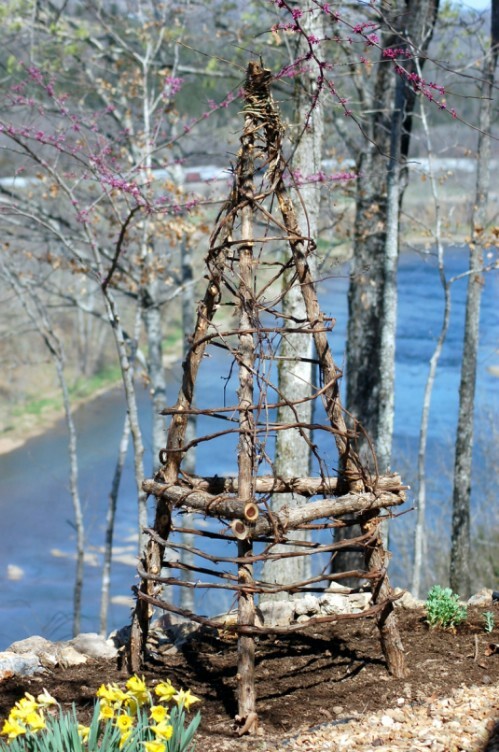 This obelisk would look great in your garden and it’s really simple to make from twigs and sticks. You build a teepee from your larger sticks and then fill in the empty spaces with smaller ones. It’s a great support for your larger plants or you could just use it as decoration – or make it a bit larger and throw an old blanket over it to build the kids an actual teepee. This starburst twig wreath is very reminiscent of the 1970s and I love it. It’s so easy to put together, too. 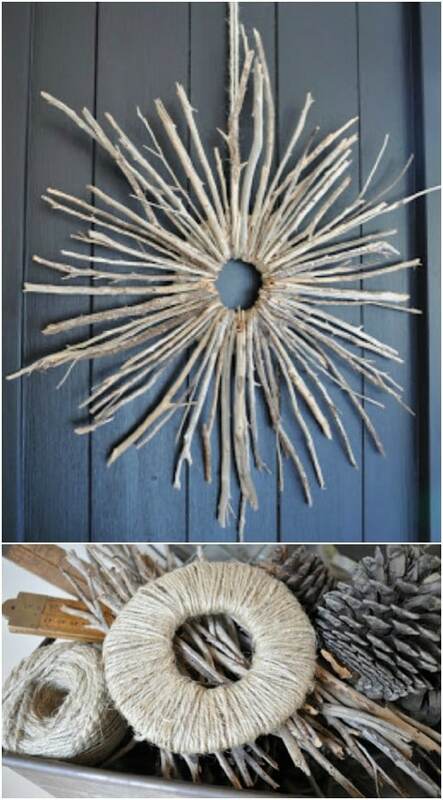 You’ll need to gather a few smaller twigs and sticks and then use a hot glue gun to attach them to a twine covered disk. Overall, it’s not a time-consuming project and you can paint the wreath or leave it all natural. Make a hanger from a longer piece of twine and you’re all ready to hang. You can turn ordinary planters or even plastic bowls into beautiful creations when you add a few twigs. It doesn’t even take that long to turn an ordinary planter into a twig planter and you can hot glue the twigs in place or even tie them in place with burlap or twine if you don’t want them to be permanent. These can be painted or left natural – there are so many possibilities! 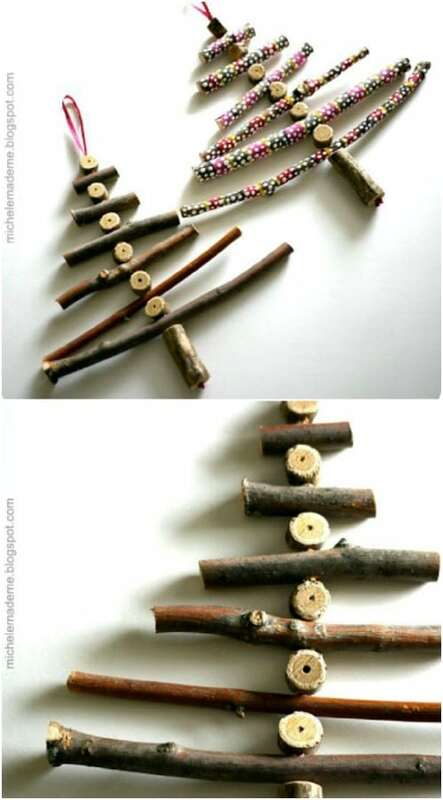 Use twig letters and numbers to decorate just about anything from your Christmas tree to the mailbox. These are great for creating house numbers or you could spell out a message and hang them on the wall. Larger letters look great standing on the porch or deck and these are so very easy to make. 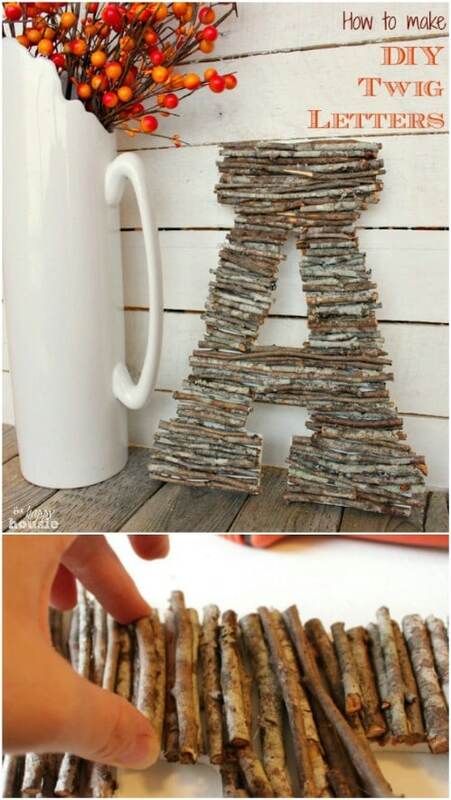 Just assemble your twigs into the letter or number of your choice and hot glue them in place. Why worry about where your carrots are or how to find your favorite herbs when you can easily mark your plants with twigs? 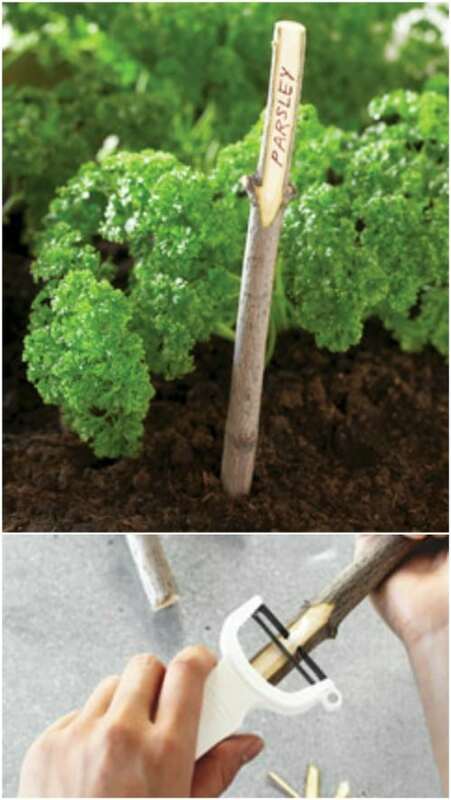 Gather up a few sticks and twigs when you are planting and then use a vegetable peeler to remove a small portion of the bark. Permanent markers can then be used to label each stick so that you can “plant” them right next to their assigned plant and you’ll always know where everything is. 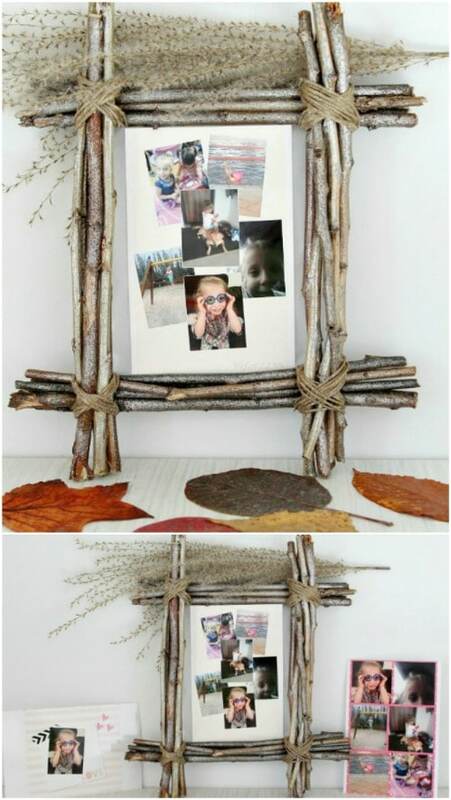 Turn a regular Dollar Store picture frame into the perfect rustic picture showcase with a handful of twigs. Kids love this craft and it’s really easy. You just hot glue the twigs around the frame and that’s about it. Or, you could do this completely handmade and skip the Dollar Store frame. 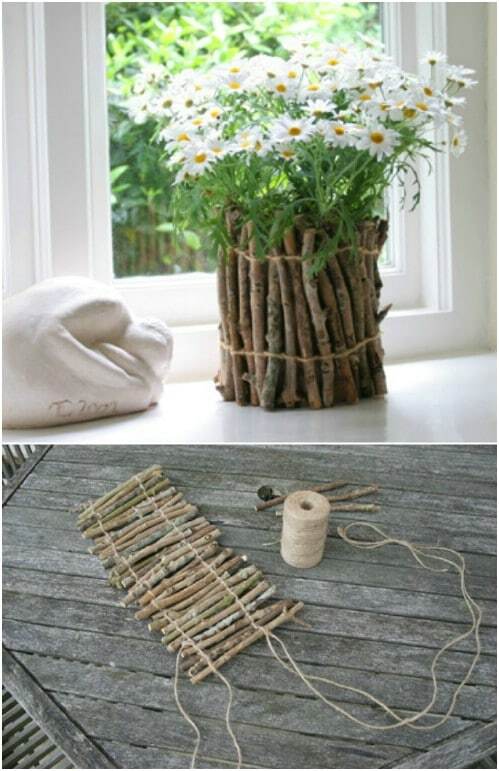 Just assemble your twigs together and tie them at the corners with ribbon or twine to house your pictures. I love decorating with twig or grapevine balls, but they can honestly be a bit expensive at department stores. You can make these yourself and paint them any color you like, or find them on Etsy where they’re really inexpensive. 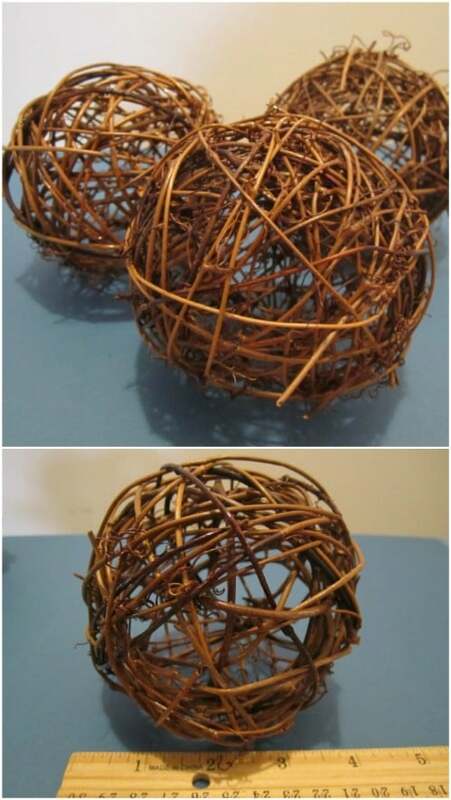 I found these four inch twig balls on Etsy and they’re just around $10 for a set of five. These are great for decorating in any number of ways and you can even use them for your outdoor garden décor. wonderful ideas for sticks! Love them!